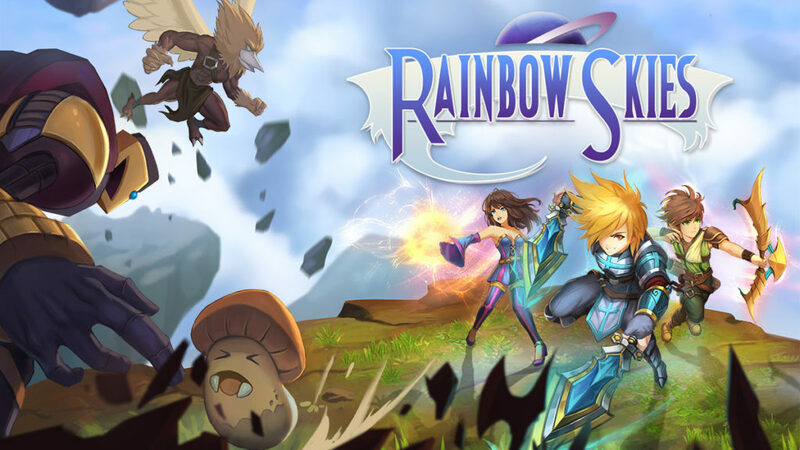 The makers of Rainbow Moon surprised us with a new treat, their new indie role-playing game Rainbow Skies. This game lets you play as three young heroes on a great adventure with lots of goals, dungeons, battles and areas to complete. With their main and side story, you will be in for countless hours of fun and exploring. You’ll start off on the beautiful floating island called Arca. Today of all days it’s Damion’s monster taming exam and what did he do the night before, participate in a drinking contest. As you can already guess, this is a recipe for disaster. Totally hungover Damion takes his exam, with even more confidence than Trump showed during the presidential elections. When he wants to show off his skills and brag a little to his best friend Layne, he smashed the electric system of the monster cage. All of the once captivated monsters roam free on Arca and they need to fix it, soon! For this type of game, the graphics and menus are very well done. The cartoony look makes the gameplay very playful and fun at the same time. 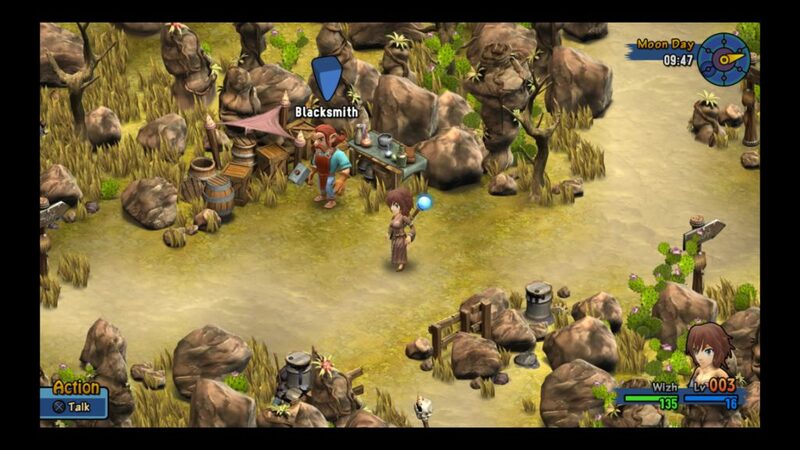 The world of Rainbow skies looks rather abandoned. There aren’t a lot of villages and it is mostly deserts, swamps, forests or caves that you will encounter. Each of those environments has their own range of monsters, which makes the game a bit more surprising. When you take a look at your menu, this is where the magic happens in our opinion. They are very well done and fit perfectly with the cartoony style of the game, this quality of menus are hard to find in RPGs nowadays. 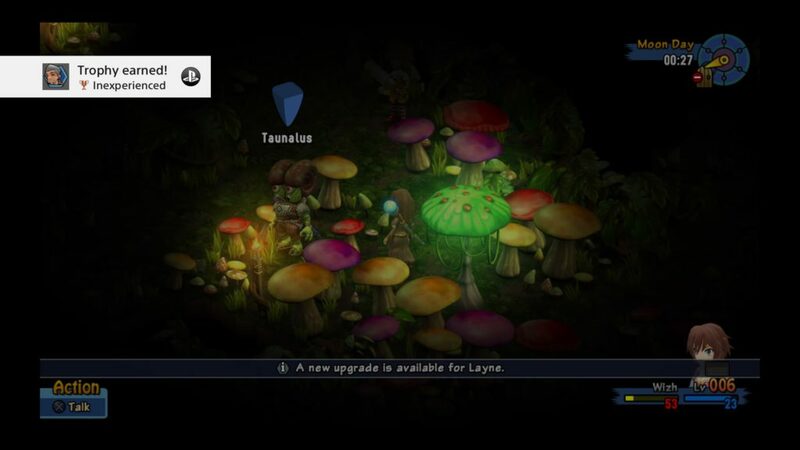 One of Rainbow Skies‘ strong points is the way its music is handled. You get a lot of different background soundtracks when you wander around the world, from eerie and mystical in caves to joyful and relaxed in little villages. When it comes to voice acting it’s rather limited every character or NPC knows only a few words or sentences and a wide range of noises. When battling the music gets more intense and every little monster you encounter has a different squeak when they get hurt, which is a little funny in some cases. Rainbow Skies is an indie fantasy role-playing game where you follow the journey of three young heroes when they depart for a great adventure, in their quest to find a way to get back home. They will encounter many enemies and must find a way to take them out. The combat system uses instead of just your regular hack and slash system, a tile and turn-based combat system . You have a few attributes that will help your heroes grow, like defence, speed, attack, magic, etc. You can upgrade them with skill stones, which you can acquire from enemy mobs or treasures in the wild. Every skill lets you gain an advantage, from faster attacks to more turns after one another for your hero. Keep in mind, you’ll have to choose which of your three heroes get the skill stones, because their attributes level up separately. Besides that, you can have an active skill set, which evolves along the way. Each character has its own fighting style and thereby their own skill line. You can buy books to get more of those skills and level them up by using it against enemies. When you progress through the game you will be able to change your battle rank. The higher your rank, the more difficult the game will be. So be careful, the attributes of the mobs will get better when you upgrade it. In return, you’ll get more experience and coins. So it is definitely worth considering if you’re up for the challenge. You can acquire gear from the blacksmith or as a rare drop from enemies. Gear can be upgraded or crafted into something better by special parts you get by defeating monsters and will level when you use it in your battles. The equipment you obtain is quite limited and you have only 3 gear slots which are a headgear, an armour and a weapon slot. Next to all that game lets you breed pets who can battle alongside you. 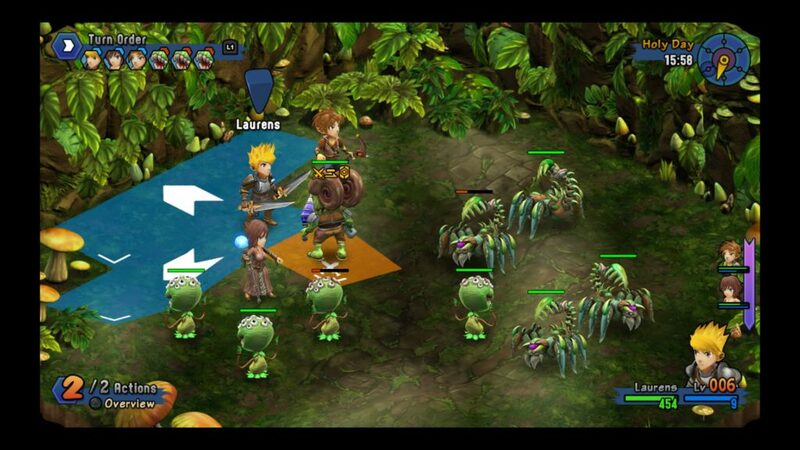 You can obtain eggs from enemy monsters and bring them to the monster farm where you can start the breeding process. When they hatch you can add them to your battle party and upgrade and level them in the same way as your heroes. The game also provides us with a lot of dungeons and quite a few boss battles. For the game completionists out there, you can explore every area and watch your progress of exploration in each area. You can also search for hidden treasures and not so hidden treasures, which will give you a lot of great loot. 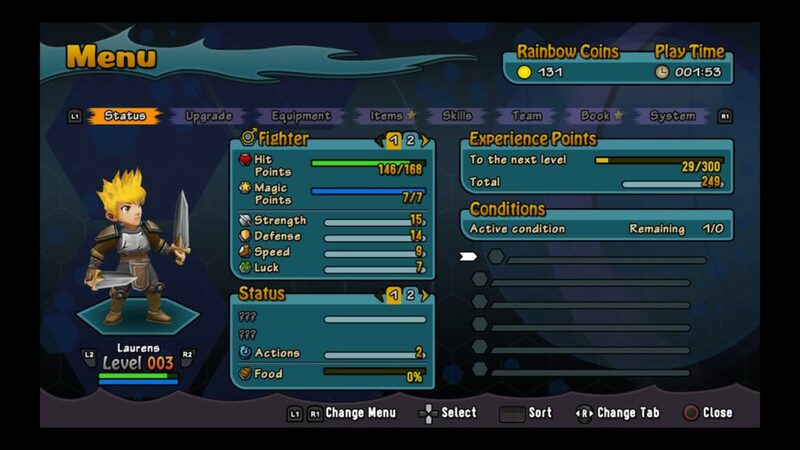 Rainbow Skies is a playful and fun indie role-playing game which lets you dive into a fantasy world beyond imagination. The journey of those three heroes is hilarious and makes up for a solid storyline. Both the quests and the story are inventive. Also, the graphics fit the theme perfectly, with only a lesser quality of voice acting, this game will let you get carried away for hours on end.